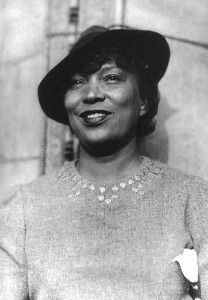 When she was 16, Hurston left her native Florida with a traveling theatrical company and lived for a time in New York’s Harlem during the early part of the Harlem Renaissance, a great blossoming of African-American literary and artistic creativity. Hurston was educated at Howard University in Washington D.C. (1921-1924) and, on scholarship, studied anthropology at Barnard College in 1925–1928 under the renowned Franz Boas. She pursued graduate studies in anthropology at Columbia University and conducted groundbreaking fieldwork in folklore among African Americans in the South. Her folklore study produced major works of nonfiction and fiction based on African- American folk culture.